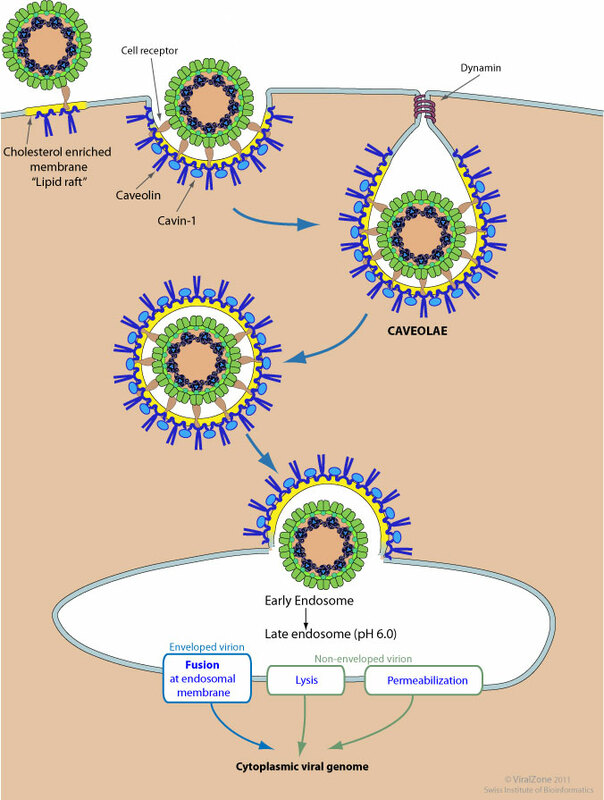 Virus internalization by the host cell via caveolae, which are specialized lipid rafts that form 50-70 nm flask-shaped invaginations of the plasma membrane. Caveolins form the structural backbone of caveolae (CAV1/caveolin-1 (AF095593:9606) and CAV2/caveolin-2(AF035752:9606) ; CAV3/caveolin-3(AF036367:9606) in muscle cells). Internalization via caveolae is not a constitutive process but only occurs upon cell stimulation. Internalized viruses bound to their host cell receptor are delivered to the early endosome. It has been first thought that bound viruses were first taken to pH-neutral organelles in the cytoplasm called caveosomes and finally delivered to the ER, but this has been refuted in . Caveolae represent a low capacity but highly regulated pathway .